Below is a summary of the latest enhancements and new features released to ZenHub Enterprise. Click the summary item to learn more about best practices, use cases, and tutorials for each specific feature. Our new write endpoints allow teams to migrate, automate, and build upon ZenHub data. View our complete API guide here to get started or view a list of potential API use cases. Have questions or want a 1-on-1 walkthrough of the updates? Send us a note at enterprise@zenhub.com and let us know how we can help. We&apos;ll setup a custom walkthrough to help you familiarize yourself with the latest updates. 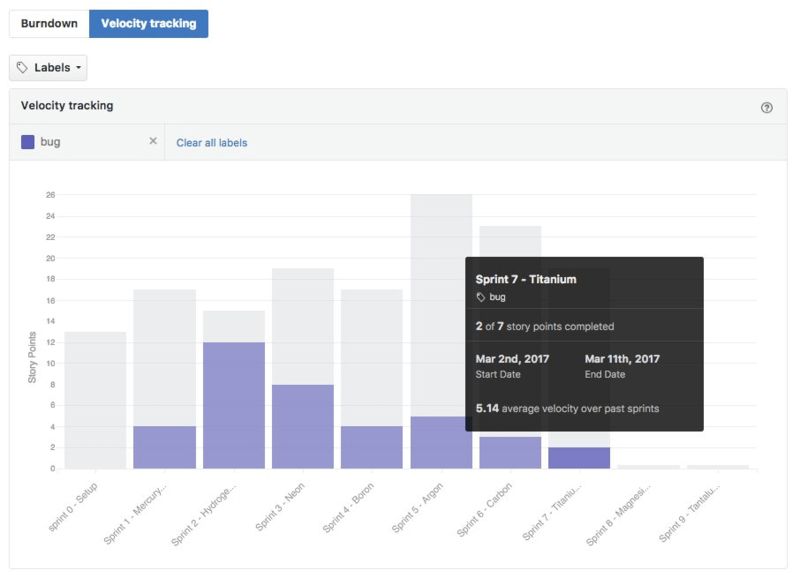 Adding labels to the Velocity Chart allows teams to break down historical data one step further. You can now answer estimation questions with more certainty based on labels. This means you know exactly how many story points were closed for a given subset of work, sprint-over-sprint. If you have connected repositories together, the Velocity Charts will pull in data from more than one GitHub repo — giving you an even more accurate idea of your speed. Velocity Charts are meant to provide insights on how much work your team can realistically tackle. During short sprints of work, holidays, spikes to setup projects, or other downtimes, it&apos;s important to filter these Milestones out of your average velocity to truly reflect the capacity of your team. 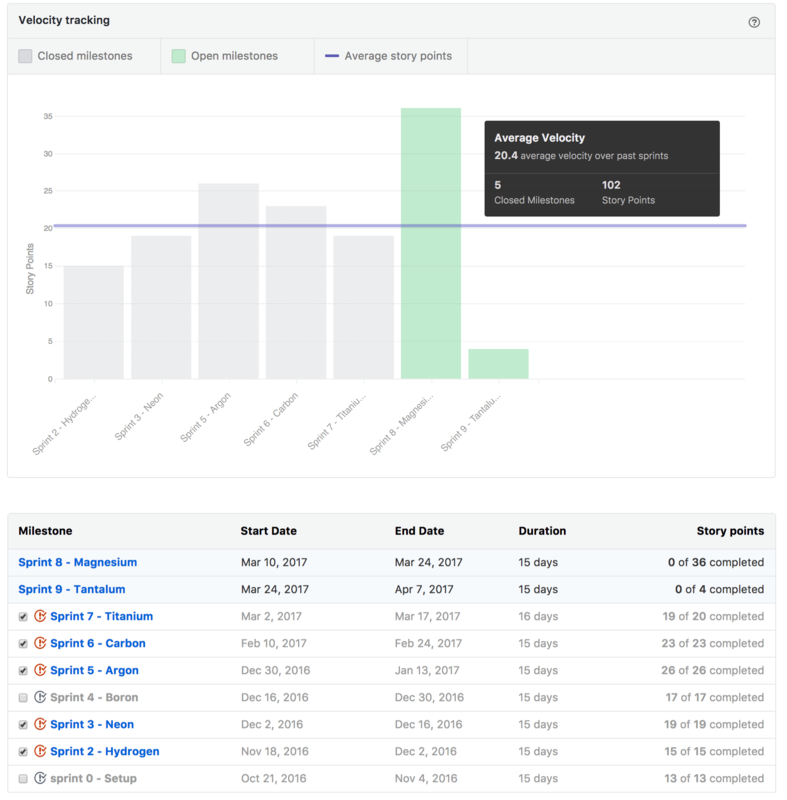 You can now filter these Milestones from your velocity report to accurately resource plan and ensure continuous improvement is part of your agile workflow. ZenHub&apos;s API is accessible for anyone interested in interacting with ZenHub in a technical manner. 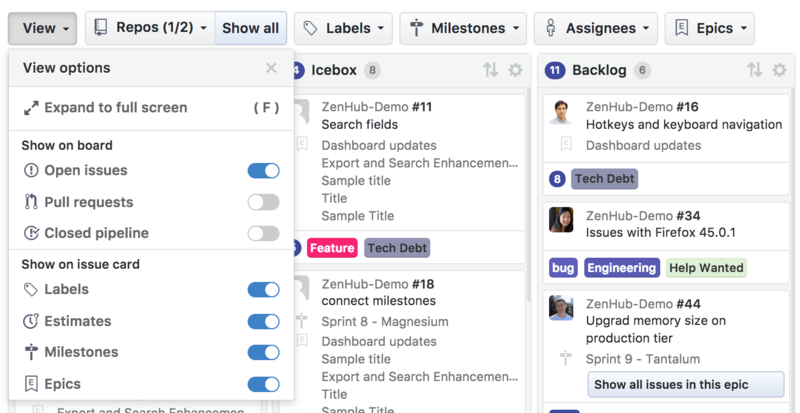 From developers looking to build custom programs using ZenHub data or integrate with other software within their development workflow, to new teams looking to migrate from other project management tools like Trello or JIRA. It&apos;s now possible to automate the flow of data using our write API! View our API guide here to get started. Automate the movement of issues within or across pipelines to manage priority based on meaningful actions being taken on an issue. If an issue is stale, raise its position within a pipeline or transfer it back to the backlog for discussion. Alternatively, if an issue gets tagged with an urgent label, raise its position in your pipeline to signal severity. Integrate products you&apos;re already using such as CircleCI or Travis into your ZenHub workflow by automating the movement of issues between pipelines when a build finishes or a test passes. One or more pull requests can be related to each GitHub issue, so it makes sense you&apos;d want to track them together as one unit through the development process. Attach pull requests to their corresponding issue, then track them together on your advanced task Boards. 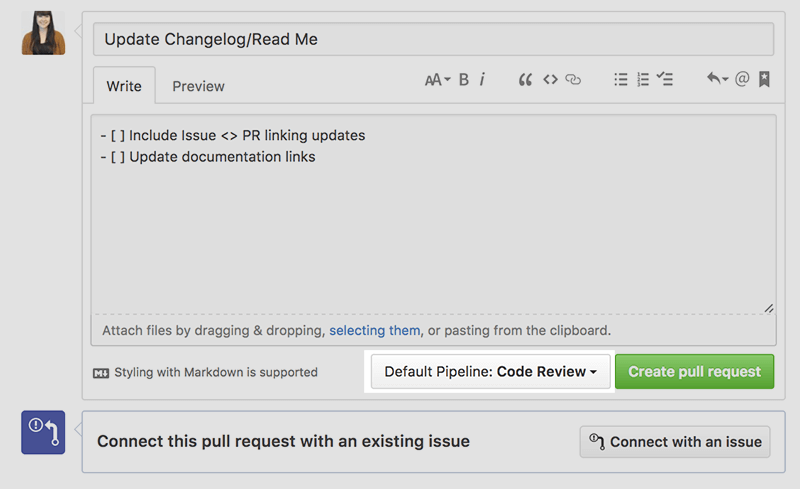 Automate your workflow by first assigning a default pipeline for submitted pull requests when you&apos;re creating the PR. This will automatically tell the ZenHub Board which pipeline the pull request should be moved to when submitted. This workflow is great to automate small tasks and save time keeping your tasks up-to-date without having to worry about spending time after your work is done. When the pull request is still open you&apos;re able to connect an issue to it. To get started, use the Connect with an issue button below the conflicts confirmation section. You&apos;ll be able to connect to any issue that lives in your ZenHub Board, including those that are cross-repo (as long as the repos are merged into the same Board). Once connected, an audit trail in both the pull request and issue will be created to provide visability to your team. Your issue will now also be pulled to the same pipeline as the pull request. Leveraging this connection alongside the default pipeline for pull requests means you&apos;re able to automate task updates! The pull request will be nested on the issue on the Board. If a connected issue is closed, don&apos;t worry – the pull request won&apos;t automatically merge. It&apos;ll stay where it is on the Board, and will disconnect from the closed issue. Similarly, if a PR is merged but its issue is not closed, they will remain connected (and the PR will reflect the new merged state). Plan for multiple projects, add various levels of tasks grouped together, and have everything ordered in the same view as your Board. Epic lists are designed to provide information on where each issue assigned to an Epic sits in relation to each other, across your pipelines. This makes it easy to tackle roadblocks, focus on what&apos;s up next, and visualize what other Epics are impacting project progress. When viewing an Epic, if there's a nested Epic, it will default to being collapsed within the list view. Simply click on Show Epic issues to view all issues belonging to the nested Epic. Epic points are the sum off all estimated story points from the issues that are within the Epic. At the top of each Epic, you&apos;ll see a section indicating how many Epic points were completed. This indicator will take the sum of all estimations across all nested Epics to provide an overview of work in progress. (Learn more about story points and estimates). Epic points give a summary of complexity of all issue estimations that belong within a single Epic. At the top of the parent Epic, the Epic points completed indicator will roll-up all estimated issue points across all nested Epics/issues. Board view options now go beyond showing and hiding closed issues, pull requests, and open issues. You now have the ability to fully customize what you want to see on issue cards. You can hide labels, estimates, Milestones, and Epic information on issue cards. This allows you to remove information that might not be immediately relevant to you in order to maximize the number of issues shown on the screen. 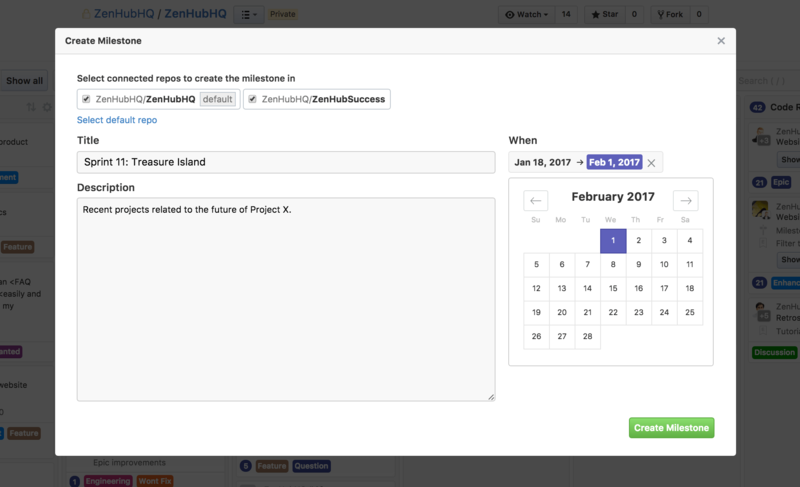 If you&apos;ve created a multi-repo task Board, ZenHub makes it easy to create a GitHub Milestone spanning several repositories. This eliminates the need to duplicate work or sync Milestones together. 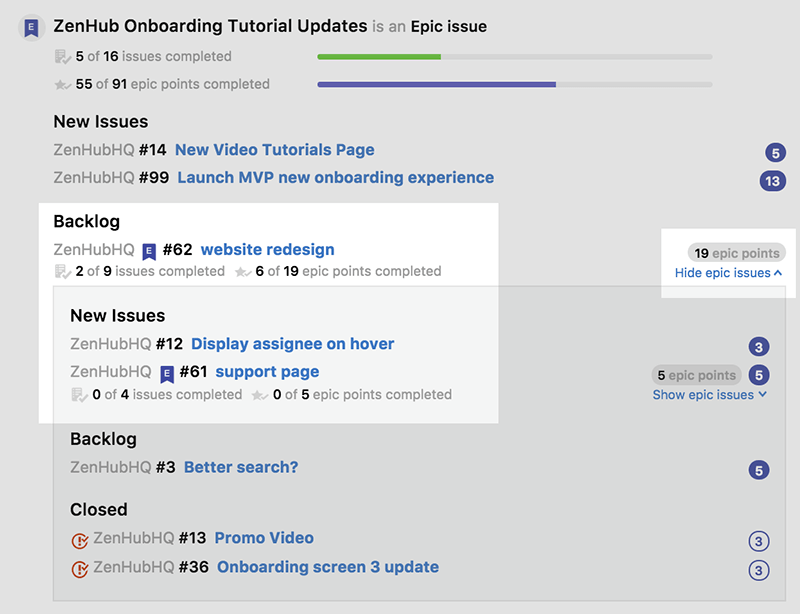 To get started, find the + beside the New Issue button on the ZenHub Board. As long as the above two conditions are met, you can successfully merge Milestones before or after you connect task Boards. New Board filters for labels allow you to see what issues haven't yet been labeled. Using the filter for Issues with no labels teams can easily understand what work still needs to be categorized on the Board. This is helpful when planning, or organizing sprints to assign work and triage accordingly. Check out our new fullscreen hotkey and updated shortcut for activating the Rapid Repo Switcher.